1) Se provieni dall'autostrada A10 GENOVA-VENTIMIGLIA direzione VENTIMIGLIA esci a FEGLINO, giri a sinistra, sempre dritto, lasci Feglino, sali per Orco, 200 m. prima di Orco giri a sinistra per Cascina Strà, imboccando la “Strada delle Rocche Bianche” (indicata); quindi segui le frecce “Cascina Strà” per 2 km di sterrato. 2) Se provieni dall’autostrada A10 VENTIMIGLIA-GENOVA direzione Genova, esci a FINALE LIGURE, scendi per Finale Ligure, ad un certo punto prendi a destra per un ponte di ferro che ha un semaforo, che ti porterà sulla via Dante lungo il fiume, <>Dopo il ponte giri a destra. Alla prima possibile giri a sinistra. Alla prima a sinistra prendi la via Brunenghi che ti porta a Finalborgo (borgo medievale) e da qui segui per Feglino, ca 7 km. Quando arrivi a Feglino segui come le indicazioni del punto 1. 1) If you are coming from the highway A10 GENOVA-VENTIMIGLIA direction VENTIMIGLIA get out at FEGLINO, turn to left, straight on, leave Feglino, follow to Orco, 200 m. before Orco turn on the left to Cascina Strà, taking the “Strada delle Rocche Bianche” (indicated); then follow the arrows “Cascina Strà” for an unmade, natural 2 km road. 2) If you are coming from the highway A10 VENTIMIGLIA-GENOVA, towards Genova, exit at FINALE LIGURE and go down to Finale Ligure. At a certain point take the right, to an iron bridge with a traffic light: that will take you to Dante street, along the river. After the bridge turn right. At the first turn you can, turn left. At the first on the left take the Brunenghi street, leading you to Finalborgo (medieval village), and from there follow to Feglino (about 7 km). 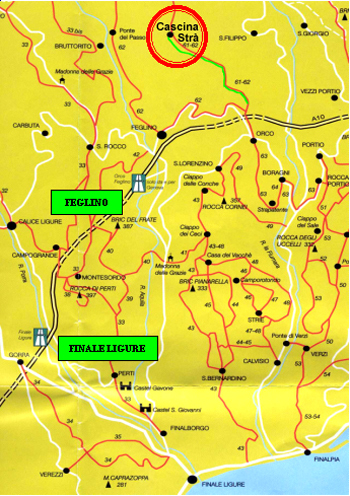 When you arrive in Feglino, follow the directions given in point 1.